Exclusive Interview with Jeremy Holt on Skip to the End from Heavy Metal Magazine! This is the first review from me in ages!! I thought I'd start with the second issue of the new ongoing Faith series from Valiant Comics. I read the first limited series run. I loved it. You can look back over the past year for past reviews. Faith is an unconventional female superhero. In a world full of bikini models, she's a fresh breath of air. By day she's a journalist and when crime comes a calling, she's a psionic superhero! She battles the best the world of villainy has to offer. This issue sees her fighting her very first supervillain! Faith is an all ages adventure. 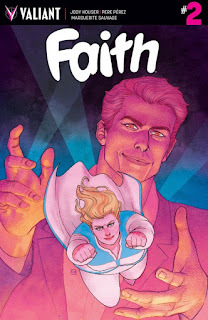 I'd be lying if I didn't say I'd like to see a more adult version of the characters life but I think it's really important that todays youth have a chance to read about a character like Faith. Faith's inner monologue is real. That's the first thing I notice when I read Faith comics. There's a lot of social commentary about body image and the way we view ourselves. However, its not directly attacking societal norms but attacking the stigma placed on women who's bodies don't fit that mold. It's not critisizing women for be thin either which is refreshing since it seems easiest to battle for fat acceptance by knocking others down. At least, this is something I observed on YouTube. Instead the issue promotes a mantra of self love and self acceptance for all. It doesn't push for rejection and I think that's a very important point. I'm very much looking forward to more Faith. GET YOUR COPY ON AUGUST 24TH!!!!! Please check out my FIRST video interview on my new YouTube channel! Don't forget to subscribe for more interviews!